Heat oven to 350°F. Grease 13x9-inch pan with shortening or cooking spray. In small bowl, stir together flours, baking powder, baking soda, salt and cinnamon; set aside. In large bowl, beat granulated sugar, brown sugar, 1/2 cup butter and the molasses with electric mixer on medium speed until light and fluffy. Beat in egg. Beat in applesauce and sour cream. On low speed, gradually beat in flour mixture until well blended. Stir in 1/2 cup walnuts. Spread in pan. Bake 20 to 25 minutes or until toothpick inserted in center comes out clean. Cool completely, about 1 hour. 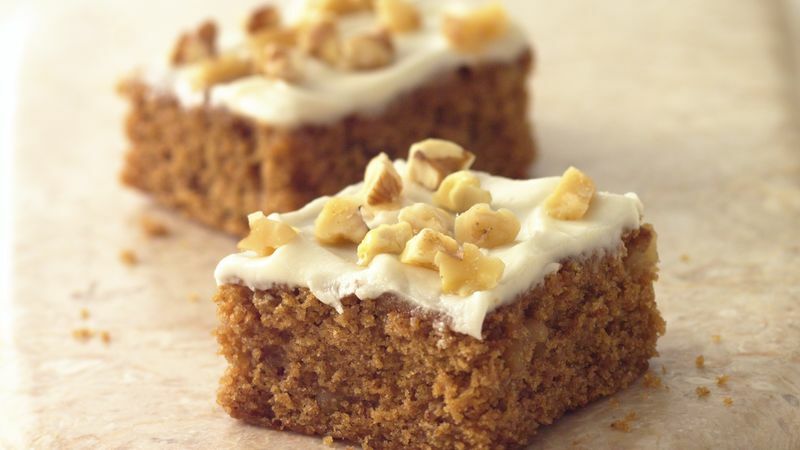 In small bowl, beat all frosting ingredients except 1/4 cup walnuts on medium speed until smooth and creamy. Spread frosting over bars. Sprinkle with walnuts. For bars, cut into 6 rows by 4 rows. Store in refrigerator.